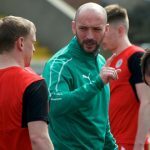 Barry Gray admits improvement is needed all round after Cliftonville exited the League Cup at the hands of Dungannon Swifts last night. Ahead when Levi Ives broke the deadlock early in extra-time, the Reds were pegged back by Johnny Lafferty’s late leveller before missing three penalties in the shoot-out that followed – leaving Gray searching for words to explain his side’s display. “It was a very, very, very poor and disjointed team performance and by ‘team’ I mean me, my staff, the players and everyone involved,” he says. “I’ve very little to say that can sum up the disappointment of how we feel after that and it’s not like me to have very little to say but I’m almost speechless. “I don’t mean to attribute blame because the blame here is with us as a team – in totality, me the staff and the players and I’ll keep reinforcing that. While I have made some comments about them publicly now and again, I still go in every week and back them to the hilt and deliver to them everything I can possibly do. At some stage, they need to deliver some of that back to Cliftonville. “At the very least, this Club is owed a big bucket of honesty. I don’t know if we see that consistently game in, game out – last night was another 45 minute spell. The Manager did, however, single Ives out for particular praise after yet another wholly committed performance from the 21-year-old defender. “All supporters have their opinions about who should be playing and who shouldn’t,” he adds. “They will talk about changes and who should have started and who shouldn’t have started. We had 11 top players on the pitch at any stage and the only one I would pick out was Levi Ives. 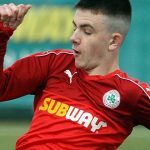 Cliftonville now turn their attention to Saturday’s Danske Bank Premiership encounter with Linfield at Windsor Park, where Gray is looking for a much better team performance. 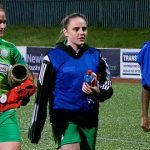 “We came into last night’s game off the back of losing to Ballymena, which was the fifth game of a four game run where we’d already beaten Coleraine, Glentoran, Newry and Warrenpoint. 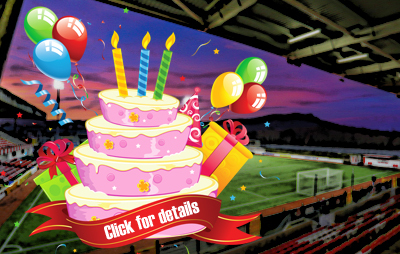 “Four wins isn’t a great run for Cliftonville. It’s better than getting beat four times and it’s a decent run but what good is four wins when you can’t get five or six? If you can deliver performances in four games then there’s no reason you can’t churn out in six, eight or ten. “The message was that we needed to make Saturday a blip, a one-off day and get on the train again and make sure that we turn that corner because anybody can have an off day. Last night, we churned out more of the same. We were minutes away from a Semi Final but were unable to see it through. “The players know my feelings on it, but being doom and gloom about it and letting it bog us even further down will be of no real benefit for Saturday. We need to find a situation where we can only focus on what we can affect – that is Linfield on Saturday.